LOS ANGELES, CA -- In the days after the shooting deaths of two black men by police, celebrities are doing more than just expressing frustration. They're demanding action, and in some cases, leading it. Beyonce called on her fans to contact their congressional representatives; T.I. 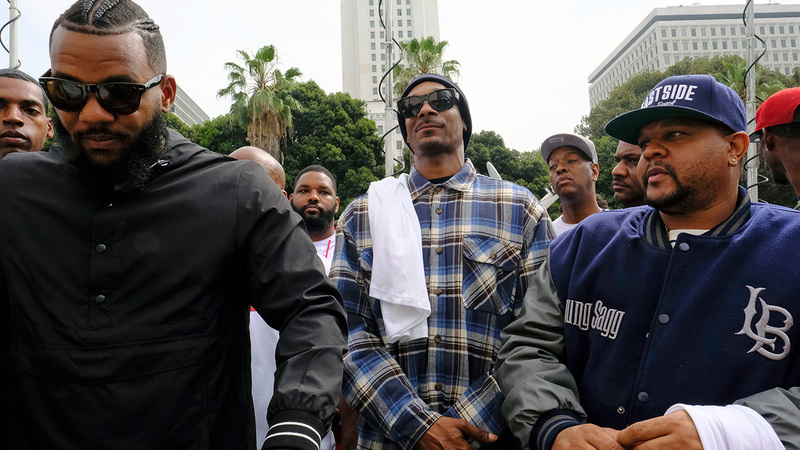 marched with thousands to protest police brutality in Atlanta; and Snoop Dogg and The Game went to Los Angeles Police Department headquarters, where they addressed graduating cadets with 100 community members. "This is how you make moves," Snoop said at Friday's event. "You make it happen. You get some dialogue, some understanding with the new recruits before they hit the streets, so that way they know we're just like them and we trying to live and go home and get some understanding." While the police-related killings of blacks has drawn impassioned commentary from celebrities before, and some have aligned themselves with the Black Lives Matter movement, the killings of Alton Sterling in Louisiana and Philando Castile in Minnesota, within days of each other last week, sparked a new level of outrage and reaction, particularly from black celebrities, calling for a movement to change. The killings of five police officers in Dallas by a lone gunman motivated by racial hatred of whites heightened the tensions and calls for the need for change. In a lengthy post on Instagram, New York Knicks star Carmelo Anthony called on his fellow athletes to "step up and take charge." "Go to your local officials, leaders, congressman, assemblymen/assemblywoman and demand change. There's NO more sitting back and being afraid of tackling and addressing political issues anymore," he wrote. "We can't worry about what endorsements we gonna lose or whose going to look at us crazy. I need your voices to be heard." But for real change to happen, the momentum has to continue, said rapper and activist David Banner. "I'm so proud of my peers" for taking action and speaking out, Banner said in an interview Friday. "The thing that I hope, though, is that out of this moment we stay energized and we move forward." Celebrities have long played a significant role in social change, from Harry Belafonte marching for civil rights to Muhammad Ali's anti-war activism. LeBron James and other basketball stars made news in 2014 when they wore t-shirts reading "I can't breathe" to protest the death of Eric Garner at the hands of police in New York City. Just last month, "Grey's Anatomy" star Jesse Williams just gave a passionate speech at the BET Awards calling for unity against police brutality. "We know that police somehow manage to deescalate, disarm and not kill white people every day," Williams said at the show. BET Awards executive producer Stephen Hill said the speech energized celebrities and the black community. "I believe that Jesse Williams' was the most amazing wake-up speech of the century," Hill said. "So for these actions to happen the week after that speech, it in some ways fueled the fire and allowed people to speak their minds more." Social media makes it hard for stars to stay silent. "If you're going to tell us what you ate for breakfast; if you're going to show us your workout routine on Snapchat, you better tell me what you feel about those five cops getting killed," said Morehouse College professor and BET News host Marc Lamont Hill. "You better tell me what you feel about those two men getting killed on Tuesday and Wednesday. You owe us that." Social media was the platform for many stars who spoke out last week. Kevin Hart called on "celebrity friends/entertainers/producers/writers/directors/athletes" to "take a day out of our schedules to simple talk & try to come up with a solution." By joining together, he wrote, "we can be heard in a tasteful way." White stars have joined the conversation as well. In an impassioned Instagram post, rapper Macklemore called on the white community to get involved and work to end racial discrimination, saying, "I can't help but think .... IF I was put in the exact same situation that Alton was in, I'd be alive today ... because of the color of my skin." A broad swath of stars discussing racism and police brutality can help shift social consciousness, said Marc Lamont Hill, who also hosts "VH1 Live" and authored the new book "Nobody: Casualties of America's War on the Vulnerable, from Ferguson to Flint and Beyond." "They create a heightened consciousness among fans," he said. "If you're in the Beyhive and you're 14 years old and you know all the choreography to 'Formation' and you drink lemonade because she told you to - you're a Beyoncé fan - you might not understand about police violence and state violence yet, you might not know why what happened in Minnesota and Louisiana was such a big deal, but... here's Beyoncé saying, 'This is a problem.'" Awareness alone does not create change. Action is required, he noted. "To turn talk into action, you have to feed people with concrete steps, and what makes these artists so special today is they're beginning to do that," Hill continued. "Jesse Williams and Talib Kweli and John Legend... they're connected, not just to powerful, inspiring rhetoric, but they're connected to powerful organizations and movements that are leading us to social change." Banner said black leaders, celebrities and others fighting for an end to police brutality need to "stick with one case all the way through until we're able to get some type of law, some type of justice, some type of follow-through." "But we never followed through with Mike Brown. We never followed through with Oscar Grant," he said, referencing two other high-profile cases of black men killed by police. "We are going to have to follow through even when it's not the hashtag anymore."